Native to South Africa, African daisy (Osteospermum) delights gardeners with a profusion of brightly colored flowers throughout the long summer blooming season. This tough plant tolerates drought, poor soil and even a certain amount of neglect, but it rewards regular care, including an occasional trim. Let’s learn the lowdown on pruning African daisies. African daisy is a perennial in the warm climates of USDA plant hardiness zone 9 or 10 and above, depending on the variety. Otherwise, the plant is grown as an annual. 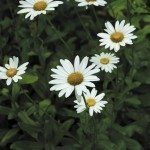 To keep them healthy and flowering, it helps to know a little about how to prune African daisy plants – which may consist of pinching, deadheading, and trimming. Pinching young African daisies two or three times early in the growing season creates a sturdy stem and a full, bushy plant. Simply pinch the tips of new growth, removing the stem to the second set of leaves. Don’t pinch the plant after flower buds appear, as you’ll delay blooming. Regular deadheading, which involves pinching or cutting wilted flowers down to the next set of leaves, is a simple way to encourage continued blooming throughout the season. If the plant isn’t deadheaded, it naturally goes to seed and blooming ceases much earlier than you’d like. Like many plants, African daisies can get long and leggy in midsummer. A light trim keeps the plant neat and tidy while encouraging new blooms. To give the plant a summer haircut, use garden shears to remove one-third to one-half of each stem, paying particular attention to older branches. The trim will stimulate growth of fresh new foliage. If you live in USDA plant hardiness zone 9 or above, perennial African daisies benefit from an annual pruning. Cut the plant to the ground in late fall or early spring. Either time is acceptable, but if you are set on a tidy garden going into winter, you may want to prune in autumn. On the other hand, if you appreciate the textural appearance of the African daisy “skeletons,” you may want to wait until early spring. Waiting until spring also provides seed and shelter for songbirds and offers protection for the roots, especially when insulating leaves are trapped in the dead stems. 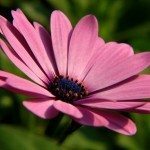 Read more articles about African Daisy.